V.com weekend vote: How long have you been playing the violin or viola? How long have you been playing the violin or viola? This morning I was reading a quote from Pablo Casals, who was asked at age 90 why he continued to practice. His answer: "Because I think I'm making progress!" Certainly, it takes time to get good at this instrument. Time, and practice. I started around age nine, and now I'm...older! I've kept playing the whole time, some years a lot more than others! Though I think that it helps to start young, it helps even more to keep practicing and spending time playing your instrument. For the typical player, five years of practice provides good foundation. Ten years allows the development of higher-level techniques, and 20 allows the building of repertoire. I'd say that if you've been playing for more than 30 years, you're probably a veteran. Of course, it really varies! Recall that Sarah Chang was playing the Bruch concerto at age 5 -- perhaps she started in another life? Like Sarah, some very talented people exceptionally fast. Conversely, others take a more leisurely pace. For the vote, pick which category best fits you. If you simply had a hiatus of not playing at all, only count the years you were playing. If you switched to viola from violin, count from the time you started violin. Feel free to talk about how long you've been playing and how the passage of years has affected your playing. 13 all together but that was 7 as a child and then 6 more as an adult. Am I 13 yrs worth? I don't think so; the big gap probably took 4 yrs back! wow... definitely made me feel old doing the math on that one. I'm just over the 30 year mark. Thankfully I'm pretty sure I'm still making progress too! My calculation would be something like Elise's only more complicated because as a child we had long summer vacations away from home, away from violins and such, and I divided my effort between two instruments. All of that might add up to ten years of study but I sure don't play as well as that. I started playing 3 years ago and I'm in my 2nd year of studying Violin at a Conservatorium. It really does feel like I started playing in another life, and have greeted the instrument like an old friend the first time I picked it up! I have been playing for 33 years but have always felt I struggled with the violin until I turned 40 and I just play for my enjoyment now and am not so critical of my mistakes so have improved out of sight since then. I've been playing the violin continuously for 35 years now. There has been nothing in my life more challenging and yet more satisfying. I just started about a month ago!! 3 school years (and almost no memory thereof) as a very young child. Then a break of almost 35 years before I started over as an adult, 6 years ago. I began violin at age 7 and played in grade school, high school and college orchestras. After college I played in chamber orchestras, community symphonies, quartets, and other groups. I played both violin and viola depending on the group until about age 45. Then I quit after a bout of bursitis in my left shoulder. Began on violin again at age 74 and played violin in a community chamber orchestra. Began viola again and now play both in different ensembles depending on the need of the ensemble. I never got beyond the stage of being a reasonably competent amateur, but I do love playing. I practice or rehearse with others almost daily. I'm almost 85 now and I plan to keep on playing as long as possible. I did it the other way around. I was a brilliant soloist in a previous life and now I'm a mediocre amateur. I am also not sure how to do the math. I started playing the violin at age 10 with group instruction supplied by the school system. I 'quit' playing the violin in school at age 14...but never dropped it entirely. I always played just enough to not lose what I had learned. Then, as an adult, I took 2 years of official lessons (30 minutes every 2 weeks)when I made the decision that I wanted to see what I could do with the violin. For the last 4 years - I have been taking an 1 hour weekly lesson. And sure enough...this is when I have progressed the most. During my partial hiatus, I always played something in addition to the violin...mandolin, piano, soprano saxophone, viola (and still do)...and now, with sporadic, but on-going lessons...bassoon. So music has always been an important part of my life. I suppose if I added up the actual 'serious' time spent (in group lessons, on my own, and now)...it would be closer to 12 years than the 30+ I voted for. As of May 7, I've been playing for three years. Sometimes it feels like forever, and sometimes it feels like five minutes. ago and I have played for about 47 years and loved it!!! Karen Ciesielski Bochenek Actually medical issues had a lot to do with it! Started on viola in 3rd grade and played consistently until 9th grade, then a long hiatus (with occasional on/off playing) until 2003 and I've been playing since then. So, I'm going count it as 18 years total. 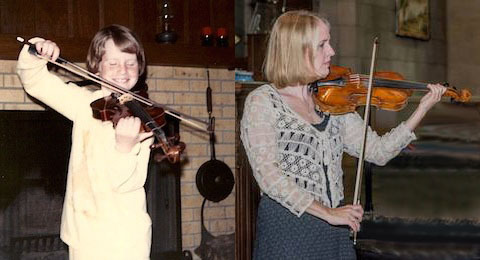 I started playing the violin 54 years ago and I'm happy to say I'm still making progress! I play violin for 50+ years, 400 public performances w/ symphony & chamber orchestra and string quartet, all not for profit. Met so many wonderful musicians in Germany, Europe, U.S., Asia. I am glad that I never dropped violin playing throughout the years. Started viola six years ago at age 66. Need to get some help tho. Really enjoy this. Well, it's really funny that I find this post today. It just made me realise that today is exactly the 10th anniversary of my partnership with the violin! It's somehing lovely to think about... so many memories! It has really carved me into who I am, and I'm willing to let it keep doing so. Now, off I go practicing my Dvorak. It's what I gotta do if I want the next ten years to be as amazing as it has been so far! from nathan morris collier. i have been playing violins for approximately 94 years; violas for nearly 35 years! It was a late but enthusiastic start at age 55, fitting violin lessons and practice into my work schedule, but now I'm "half" retired. I've been studying violin for 9 years, currently playing with 4 community orchestras (occasional gigs with a few others), and our string quartet. I added viola 2 years ago for a chamber music class. Personal practice time has averaged an hour a day, but with lessons, rehearsals, and concerts, it's a lot of playing time.